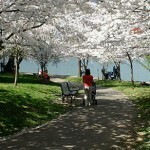 This meandering 7.5-acre memorial—near the Jefferson Memorial, just off the Tidal Basin—pays tribute to both a president and an era. 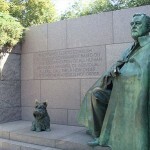 Franklin Delano Roosevelt’s accomplishments during his four terms in office are honored through sculptures and words etched in four outdoor granite galleries representing time spans from 1933 to 1945.The 32nd president is shown in a bas-relief that depicts him riding in a car during his first inaugural, alongside his beloved dog, Fala. 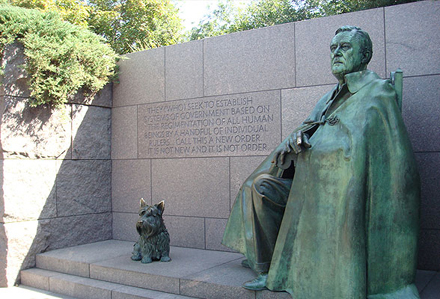 Opened in 1997, the memorial spurred controversy when advocates for the disabled argued that Roosevelt should be depicted in a wheelchair, which he used after contracting polio in 1921. Because Roosevelt was careful never to be seen in his wheelchair in public, designers instead decided to include a statue of Roosevelt seated, covered in a cloak. The design also incorporates Braille in some of its relief sculptures, as an aid to visually impaired visitors. 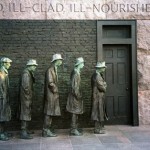 The park-like memorial is well-suited to photo ops; tourists especially enjoy posing among the figures depicted in the sculpture “Bread Line,” which conveys the mood of the country during the Great Depression. 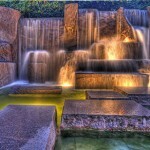 You’ll also find a number of pools and waterfalls, and a statue of Eleanor Roosevelt. This is the only presidential memorial to include a tribute to a First Lady. 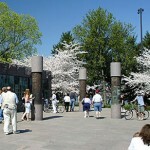 The memorial includes a small bookstore and gift shop, which offers souvenirs related to Roosevelt. It is open from 9:00 a.m. to 6:00 p.m. daily. There are no food concessions on site, so plan accordingly. 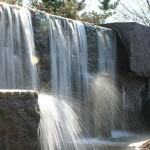 Hours: The FDR Memorial is open 24 hours a day, every day of the year. Park rangers are on hand to answer questions from 9:30 a.m. to 11:30 p.m. daily, except for December 25.